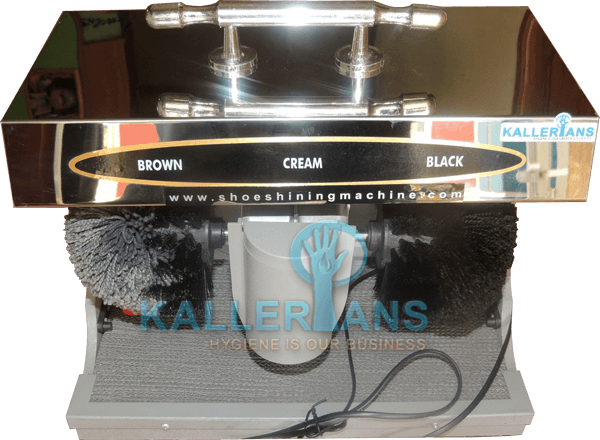 KALLERIANS Shoe shining machine is very essential to every Hotels and IT corridors to welcome its customers and workers.With its unique and stylish outlook, KALLERIANS stainless steel top shoe polishing machine is the symbol of Hygiene. It is compact and highlights a ROYAL WELCOME. 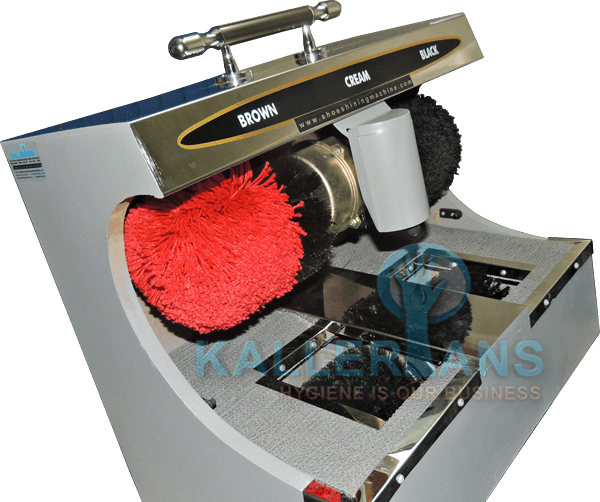 KALLERIANS manufactures shoe polishing machine in two different versions. 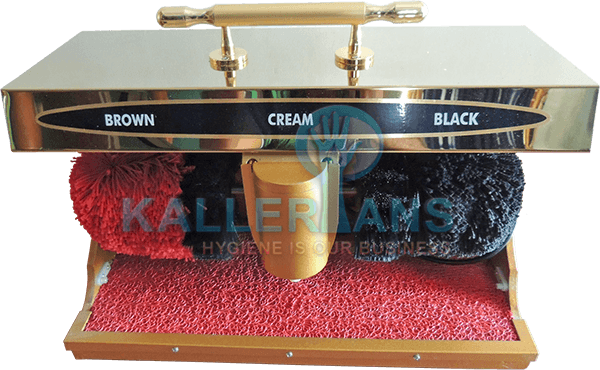 One stainless steel top shoe shining machine with stainless steel handle finish and Brass top shoe polishing machine with shiny brass color finish which is something extraordinary. 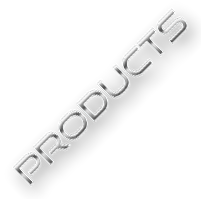 The results of both machines, whether it has a polish dispenser or not, will be: quick, precise, satisfying and most of all shining – just like the high-quality brushed stainless steel surface presented by the design highlight itself. 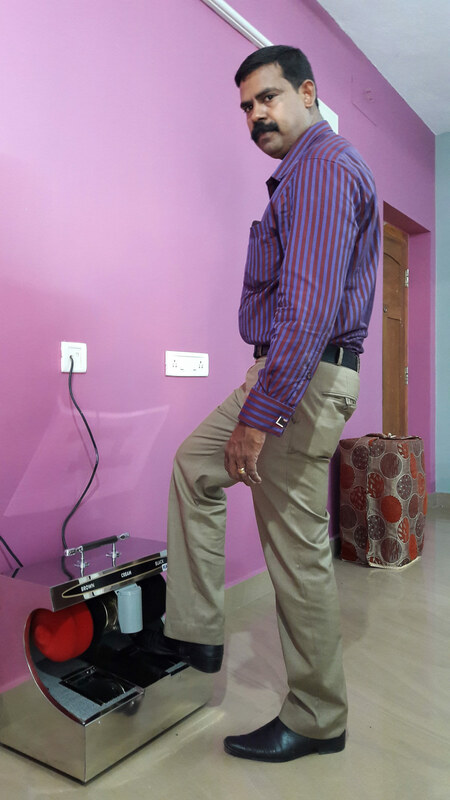 The new industrial shoe shiner is compact in design that can be placed next to the wall, in a corner or standing freely in the room, with its classic column design it always cuts a fine figure. Especially spacious corridors, wide entrance halls or stylish lobbies will be appropriate sites for a machine like this. 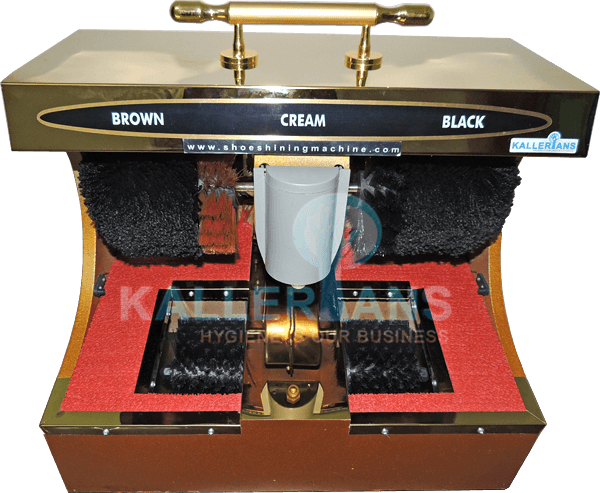 Shoe shine machines are simple buffers that polishes and buffs shoes nice and clean. Shoe shiners come in a variety of types and styles and they either work by electricity or batteries. 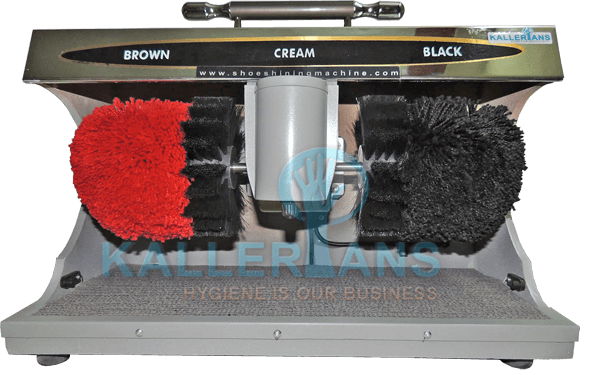 The Shoe shining machine has two brushes each with 2 different types of fibers – Nylon/Horse hair and Cotton thread. 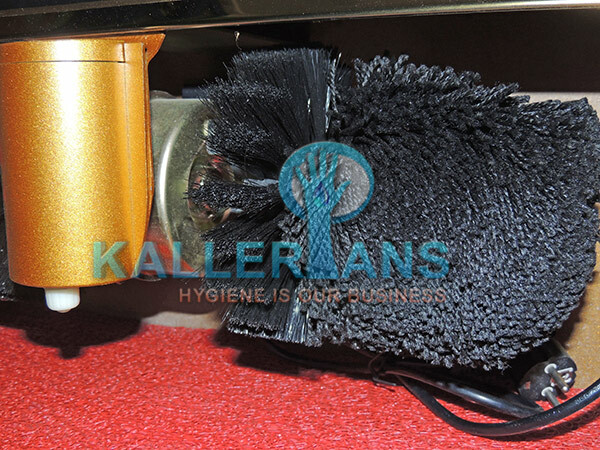 Nylon bristles serve the purpose of cleaning the surface of the shoe before applying wax or polishing, after the cleaning process wax can be applied from the wax container located at the center of the shoe shining machine. The container is loaded with neutral wax that can be applied for any colored shoes( Black shoe or Brown shoe ). The user can apply the wax by gently pressing the shoe against the roll-on tip at the bottom of the container, which applies a thin layer of wax required for shining the shoes/ polishing the shoes. After applying the wax, the user must place the shoes near the cotton threaded bristles that shines the shoe. 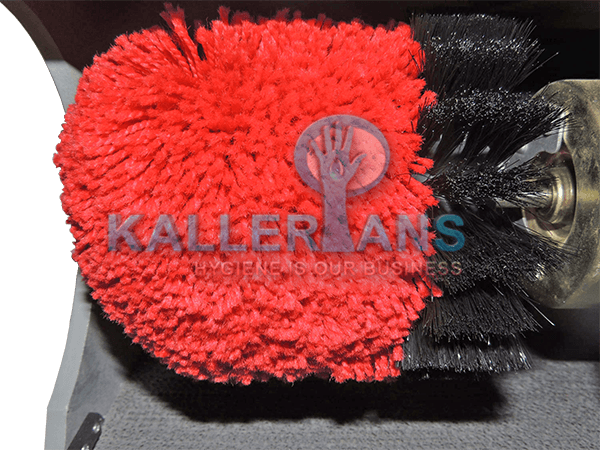 Users with Brown shoes can use the red colored/brown colored cotton threaded bristles. 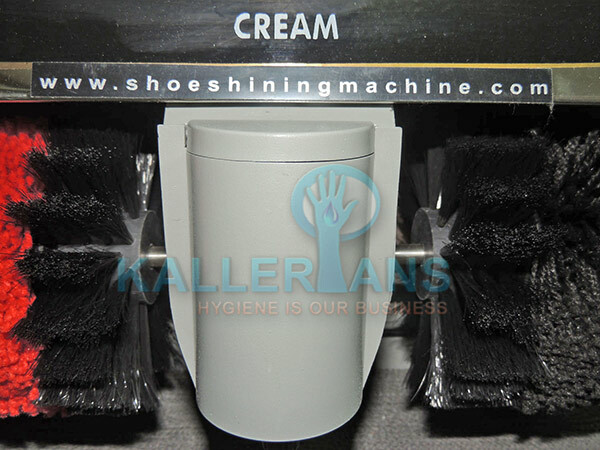 The machine with sole cleaner, cleans the bottom of the shoes simultaneously. 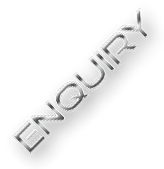 These types of machines are compact and essential for the corporate offices, hotels, residence, shopping malls, showrooms and places where carpets are used to cover the floors. 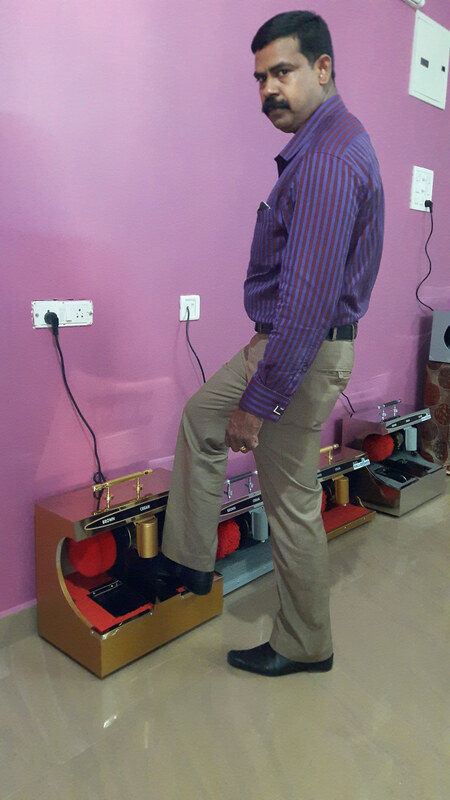 Shoe shining machines needs cleaning, to maintain a pristine working condition and best performance. 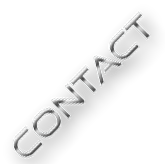 Clean the machine with mild detergents, without spilling water or reactive agents on circuit boards and sensors. Never run your machine when the bristles are damaged or if the buffers are out of shape, which will not shine the shoes effectively. At this point try changing the buffers, as the new one will provide you the shine and clean like that of the new machine.